Villagers across the area commemorated the moment 100 years ago when the guns fell silent across Europe. 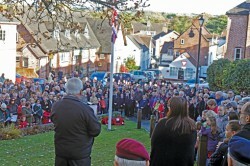 As many as 500 people gathered for the Remembrance service on the village green in Alvechurch (right), organised by Alvechurch Ex-Services Association. 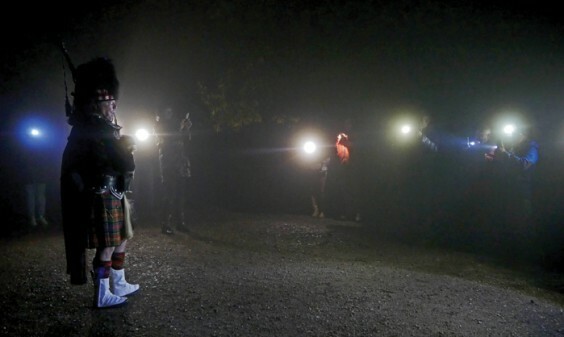 The day began with the strains of Battle’s O’er from lone piper Paddy McGowan (above) at the top of Cofton Hill, playing at 6am to a small group who had gathered before dawn in the Lickey Hills. The centenary was also marked by a Peace Concert at Alvechurch Middle School, where around 200 people listened to Alvechurch Community Choir, which organised the event, Cantare Choir and Cantare Children, youngsters from Music Academy Midlands, The Acoustic Belles and Withybed Poets. Above: Alvechurch Community Choir and Cantare Choir sing one of their three joint songs.